Ulysse Nardin is introducing the first automatic watch in the Freak Collection, the Freak Vision: a Haute Horlogerie wonder incorporating the revolutionary innovations unveiled in the Ulysse Nardin InnoVision 2 Concept Watch at SIHH 2017. Among the game-changers: a super-light silicium balance wheel with nickel mass elements and stabilizing micro-blades and a new case design made even thinner by a box-domed crystal. In technical terms, Freak Vision is provided with a Calibre UN-250 movement, large diameter silicium oscillator with nickel inertia-blocks, self-regulating silicium micro-blades and silicium finishing gear train. The timepiece offers a 50 hours power reserve at constant amplitude. The case is made of platinium with lateral «brancard » side bars coated blue rub while the bezel is titanium coated blue rubber lining with 3 titanium riders for easy handling. Manual winding is also possible with the back bezel. 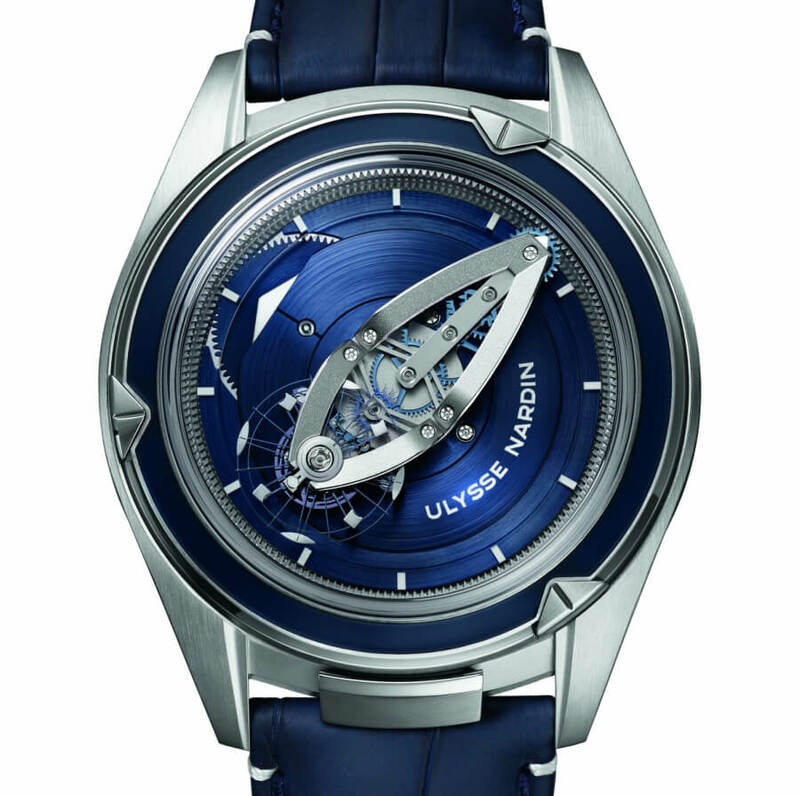 The dial is in sapphire, with engraved hour and minute indexes. 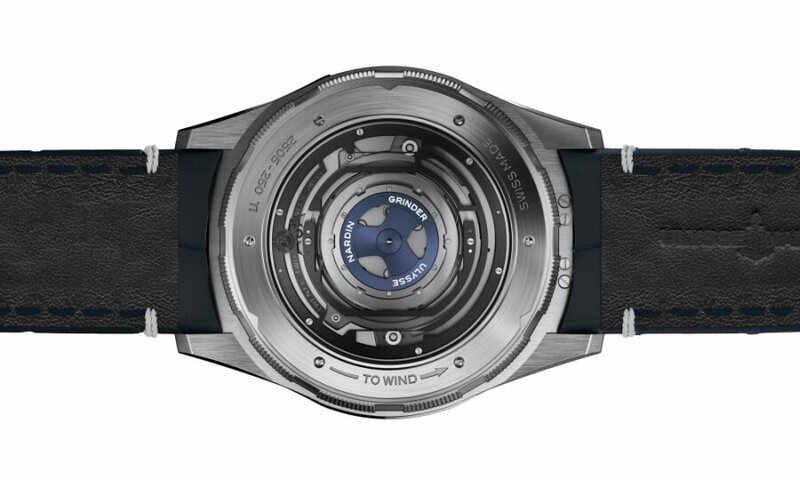 The case back is made of titanium with 6 screws and provides view of the “Grinder” through the domed sapphire crystal. Freak Vision provides 30 m water resistance. This watch features a Grinder Automatic Winding System, which completely revolutionizes energy transmission, surpassing existing systems for efficiency by a factor of two. Grinder takes perfect advantage of even the slightest movement of the wrist. The oscillating rotor is linked to a frame containing four arms, which gives the automatic system twice the torque – like having four pedals on a bike instead of two – while a flexible guidance mechanism drastically limits friction. 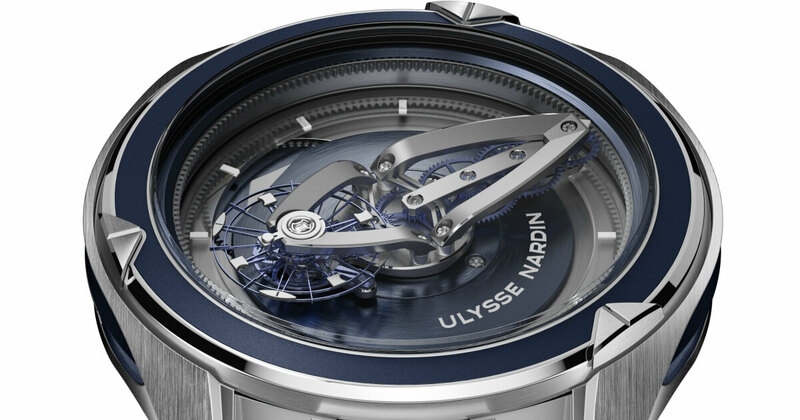 Furthermore, the timepiece brings as a technical novelty element Ulysse Nardin Anchor Escapement, which is based on the principle of flexible mechanisms, exploiting the elasticity of flat springs. It presents a constant force escapement made entirely of silicium, and features a circular frame with a pallet fork that moves without friction. The pallet fork is fixed in the center and supported in space on two minuscule blade springs. Mounted perpendicular to each other, they are subjected to a bending force that curves and keeps them in a bi-stable state. The result is a positive energy balance that maintains the oscillations of the balance wheel at a constant rate without influence of torque variation from the mainspring.